Week to week, I’m so busy thinking of new recipes that I occasionally forget about the old ones. When my younger son casually mentioned that I didn’t have to “experiment” so much with sweet potatoes and kale, I figured it was time to bring out a few of the Fulton family favorites! I really like vegetables, especially sweet potatoes, so the experimenting to which my son referred is simply cooking what I enjoy–and apparently placing that burden on my kids! Taking some pity on them, I responded with their much requested homemade chicken nuggets, Parmesan crusted potatoes and breakfast cookies. The former are baked, not fried, and the latter are healthy, but who doesn’t like the sound of cookies for breakfast? As simple as it is, my husband and sons are also quite happy whenever rice makes an appearance on their dinner plates. Add a little butter or soy sauce and this inexpensive pantry item is suddenly a side dish that my crew could eat nightly. Though versatile and light enough to accompany nearly any main dish, rice is also hearty enough to be the centerpiece of a meal. Consider its range: rice is the expected base for Asian stir-fries and Indian curries, a necessary building block in the ever-popular Mexican burrito bowls, my husband’s choice over noodles in good old chicken soup, and an essential component in my recent recipe for sushi bowls. With options including brown, white, black, wild, basmati, Arborio, long grain, short grain and instant, there’s little room for boredom. (For the record, there are believed to be over 40,000 varieties of cultivated rice.) And it doesn’t hurt to cook extra–leftover rice makes for spot-on fried rice, speedy grain-based salads, and easy rice pudding. Though cooking rice on the stovetop is simple enough, the following foolproof method of preparing rice ratchets up the flavor and is hands-off after the initial sauté. 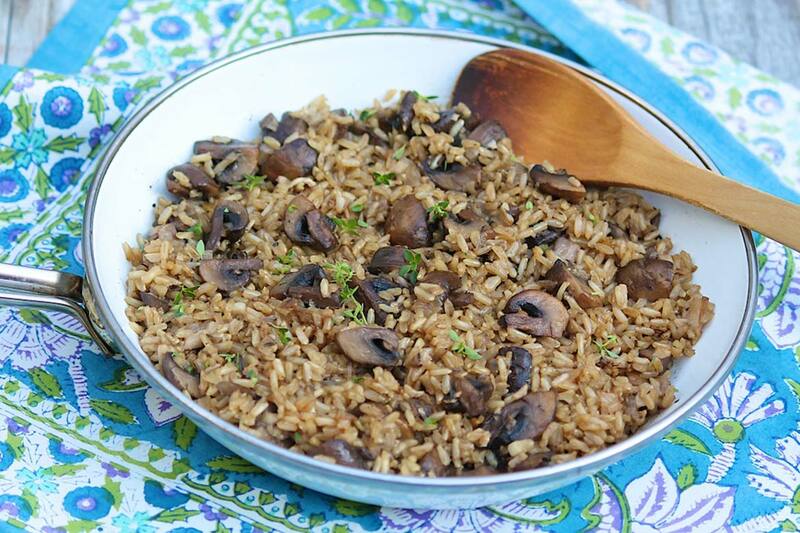 Mushrooms and onions compliment the earthiness of the brown rice and pair beautifully with beef, poultry, pork, and even salmon. For a satisfying meatless meal, top with your favorite cheese (blue cheese, Gruyere, Asiago, Fontina, and Parmesan are all good options) and serve with a green vegetable. Over the years, I’ve made this hearty side dish countless times for family, friends, and even at a number of cooking demonstrations. But just before submitting my column, I decided to add some chicken to the mix. If the cooking times aligned, this would be a simple way to morph the simple side dish into a convenient all-in-one meal. I used one pound of uncooked boneless, skinless chicken breast, cut into bite-size pieces, and stirred it into the pan along with the rice. The mixture completely filled my 9-inch diameter pan, but did not overflow. (A skillet with a 10-inch diameter would allow for a little more wiggle room.) The meat was cooked through, but not dry, by the time the rice was done. Thigh meat would likely be more tender. I used low-sodium chicken broth, and did think the chicken version would benefit from a touch more salt and pepper. After the successful addition of chicken, I got to thinking that some sliced kielbasa or crumbled sausage would be another welcome addition. If you’re tempted to experiment with add-ins that sound good to you, I recommend trying the recipe as written first. Then you can determine what and how much you’d like to add based on flavor, necessary cooking time, and the capacity of your pan. 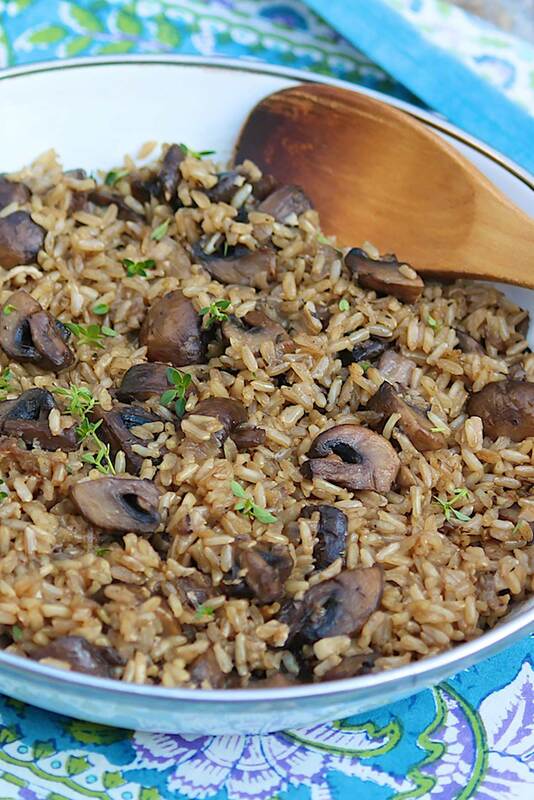 Earthy mushrooms and a few other convenient ingredients turn basic brown rice into a special side dish. In a pan with a tight-fitting lid that can go from stovetop to oven, heat the oil over medium heat. Add the mushrooms and onions and sauté for 8-10 minutes or until they are browned and beginning to caramelize, stirring occasionally. Stir in the garlic and cook, stirring, for 30-60 seconds or until you can smell the garlic but it is not turning brown. Add the rice and stir until coated. Sprinkle with the salt, pepper, and thyme. Carefully, pour in the broth, increase the heat, and bring to a boil. As soon as the mixture boils, remove from the heat, cover, and bake for 45 minutes or until the broth is absorbed. Remove the pan from the oven and allow it to sit, covered, for 10 minutes before serving. If you’d like to top with the optional cheese, quickly sprinkle 1/4 to 1/2 cup overtop, and replace the lid. *On occasion, I have replaced the onion half with the chopped white and light green parts of one leek. **If using a standard 14.5-ounce can of broth, this will be just under 2 cups. You can make up the difference with water–or even white wine if you have some on hand. No need to open a second can for the scant quarter cup still needed. ***If you do not have thyme on hand, or if you’re simply not a fan, the rice will still be delicious without. You could also substitute Italian seasoning. Awesome dish!!! I added frozen vegetables 10 minutes before I took it out of the oven. Great idea, Jennifer, and I’m delighted you enjoyed! I make this nearly every week and have made it for several friends and neighbors, too. It’s always well received. Thank you for the dependable recipe! It’s so nice of you to make this and share, Ellen. Thank you for your thoughtful comment! I make this with the vegetarian option often and recently brought it to my neighbor who had surgery. She loved it. It’s a great dish to take to someone in need. This is a good dish to give to a friend. Thanks for mentioning and so glad it’s a keeper! This isn’t showing the whole page! The right hand side is short. I can guess what it says but thought you should know. Thanks for your comment. It looks fine to me now, so perhaps there was a temporary glitch. If you have trouble again at some point, I am happy to email a recipe. This is to die for! I made it with beef broth because I had an open box that needed to be used up. Other than that, I followed the recipe exactly. Delicious! Fabulous, Karen! I’m so happy it was a hit and a good way to use the broth you had on hand.